Bangkok, without any doubt, is the real deal when it comes to being a top culinary wonderland in the world. 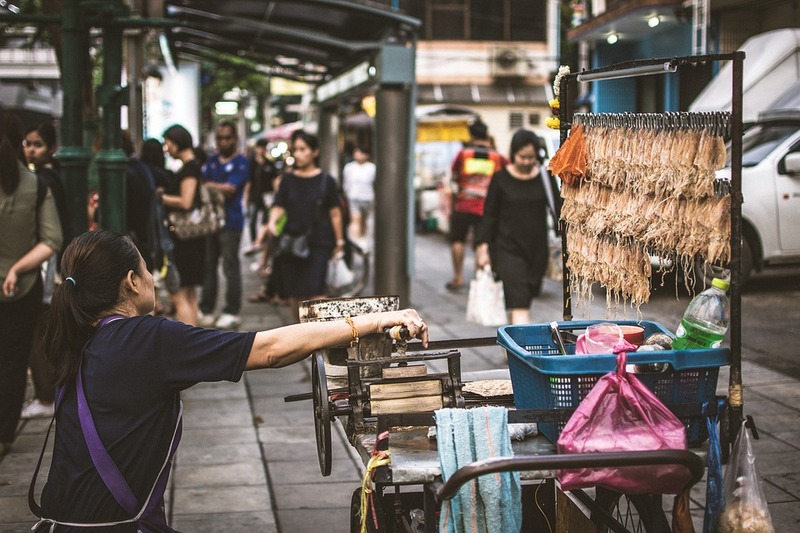 If you’re a food lover with a hungry soul, these exceptionally delicious Bangkok street food dish recommendations listed below are just for you. Bangkok, without any doubt, is a true deal of what it is to be a top culinary wonderland in the world. If you’re a food lover with a half-the-daytime hungry soul, then these exceptionally delicious Bangkok street food dishes recommendations is for you. This food-haven city truly represents itself well. Countless corners, pushcarts, bazaars, vendors, shophouses, and small towns throughout Bangkok are all blessed with fresh and quick one-plate dishes. Give yourself some time to navigate along the streets, and you will definitely find yourself in the midst of an endless supply of food. 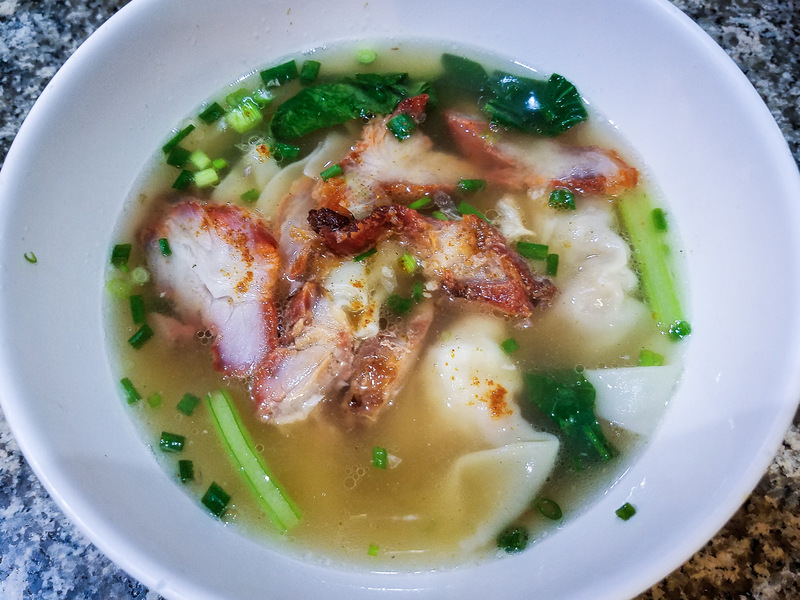 Thai Wanton Noodle (Ba Mee) is definitely a mind-blowing combination of flavors. It has been a hit with both locals and tourists for years. Being simply a combination of egg noodles, pork slices and wanton, what truly makes it is the special sauce and condiments mixed from various different ingredients. This combination truly creates a distinctive and remarkable flavour. Ba Mee is usually cooked with thin yellow noodles, and utilized with a fair amount of oil and pork lard. This small addition gives the dish a more lean and light feel, which is perfect for those who don’t want to get their holidays stuffed with greasy sensations. Many Thai-style wanton mee dishes you will bump into are often served with crab meat and char siew. Sometimes, red chilli flakes are also added for presentation and a little extra spice. This authentic Spicy Thai Seafood Soup’s basic elements are pretty down-to-earth. Being composed simply from seafood, lemongrass, coconut milk and lime, the dish is surprisingly thrilling and incredible in taste. In Thailand, Tom Yum Goong is widely preferred for numerous health benefits. It is said to give a significant boost in people’s moods as well as being a cure for fevers. Occasionally, you will see the dish be served in a creamy version elsewhere, by adding some condensed milk to the whole mixture. 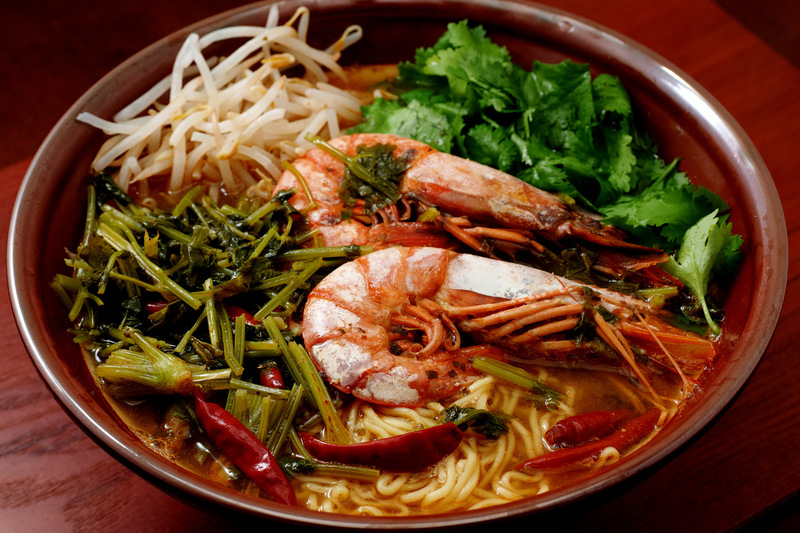 There are also ways to maximize the Tom Yum’s flavor by including types of innards or meat, alongside the main seafood ingredient. Pork Trotters Rice, also known as braised pork leg and rice (in Thailand: khao kha moo ข้าวขาหมู) is one of the standard street stall dishes in Bangkok. With a similar taste to the Chinese version of pork rice, Khao Kaa Moo is considered a must-have staple whilst in Thailand. 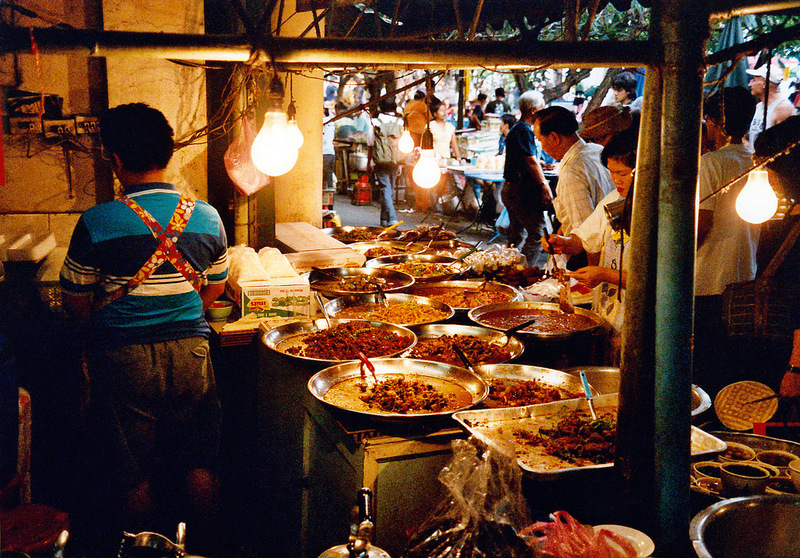 The dish is just beyond popular as it’s available among hundreds of Bangkok street food corners and night markets. 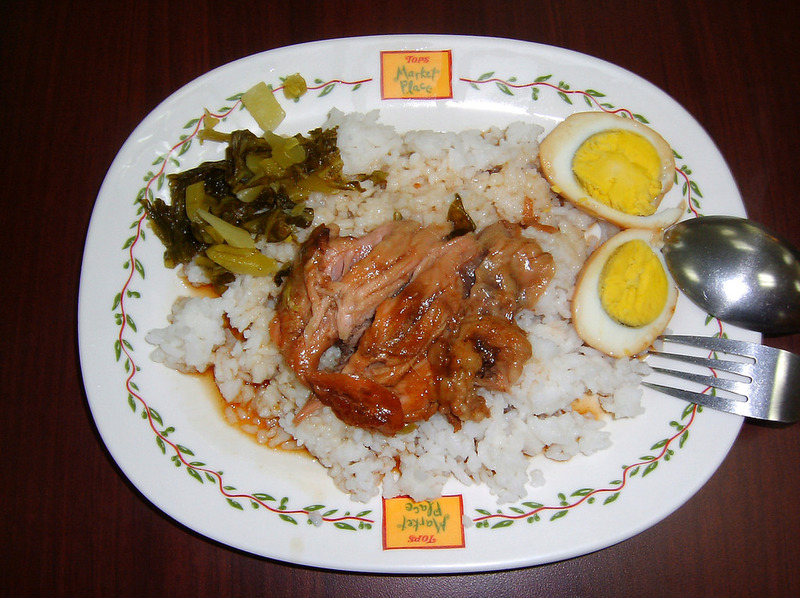 To simply break it down, Khao Kha Moo is commonly served in individual portions. A single order will include white rice topped with braised pork leg and garnishing. With a little vinegar and oil, Khao Kaa Moo brings in a tender sweet taste at the beginning, and savory tastes of well-braised meat at the end. The dish is promised to be a heart-warming highlight of Thai cuisine to many foreigners. 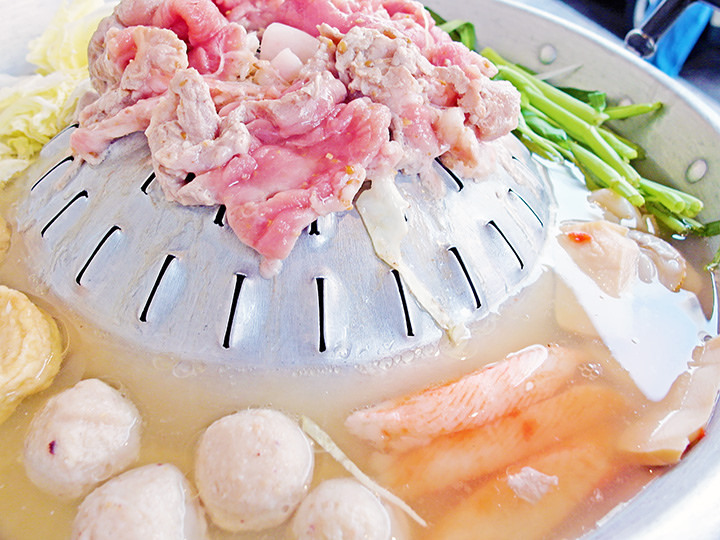 A serving of Mookata includes steamboat(hot pot), grilled meat, some bacon, and some chicken stock. But the true secret lies in the the soup itself. Then, toss the bowl with some shaved green papaya, dried shrimps, chopped onion, fish sauce, peanuts, and vinegar. Not to mention meat juices will drizzle and mix with the soup make the broth even more savory. Yes, the dish is a blessing that stimulates anyone’s appetite. In certain stalls, udon noodles, cabbage, sweet corn, tofu, asparagus, bean sprouts, and Enoki mushrooms are also added. For Mookata, it’s our recommendation you give the roadside stalls a chance before opting for the luxury or a restaurant. 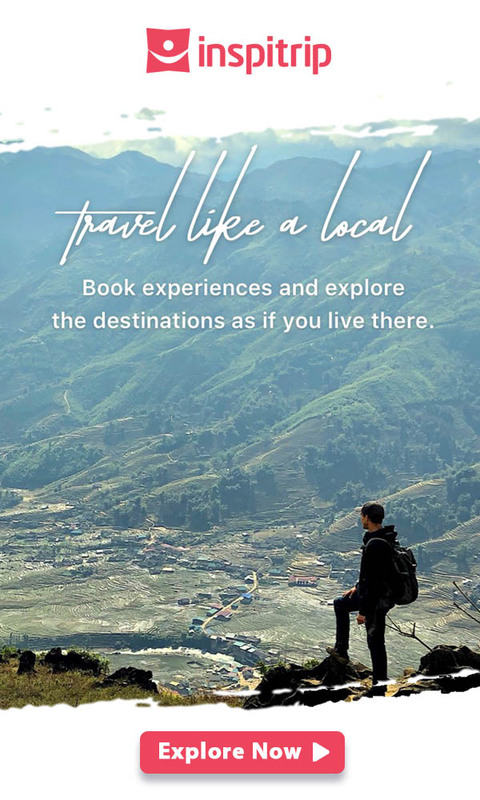 Experience the dish as a local would! 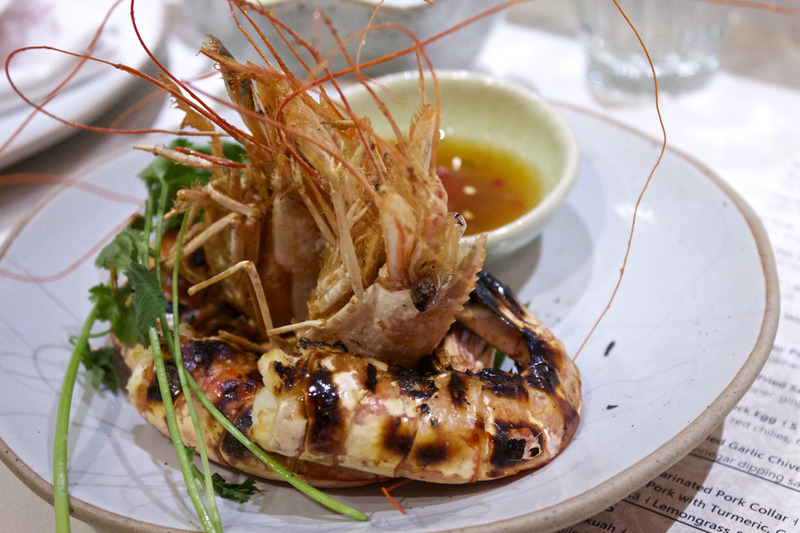 Grilled Prawns will definitely be a dish that leave you in awe. Watching the prawn being split down at the middle and grilled with bubbling head juices on charcoal will make you want to have it by the mouthful. Its natural saltiness is truly a game changer. Goong Yang is usually showcased together with types of seafoods like squid or fish, and served with a sweet and spicy dipping sauce. Keep in mind that there is differences between river prawns and sea prawns. Sea prawns are slightly sweeter than their river counterparts, but both types are equally as juicy and delicious. Normally, Goong Yang costs more than 800 THB/kilogram in most of the restaurants in Bangkok but in Kanchanaburi town nearby to Kanchanaburi War Cemetery, there is a restaurant called Chuk Ka Don located by the River Kwai that serves the prawn at only 380 THB a kilo. 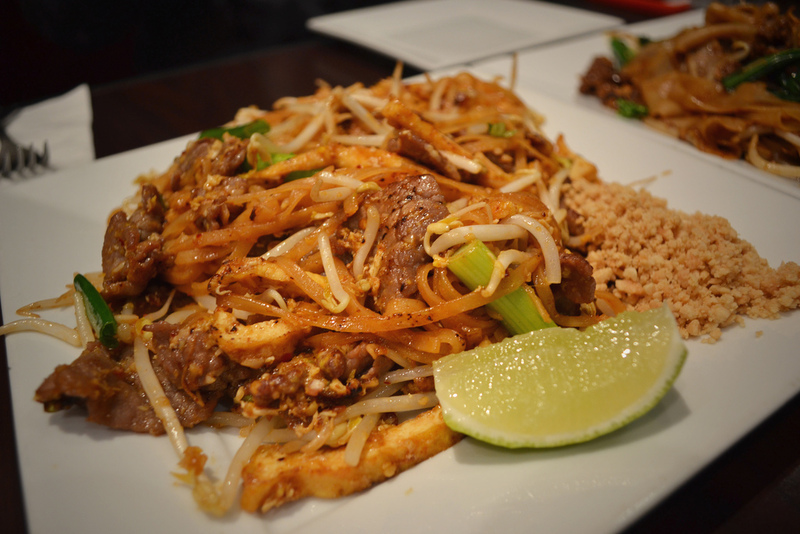 Pad Thai is probably the most well-known Thai dish internationally. Most of the time, when you ask a foreigner to name a Thai dish, it’ll be this one – and for good reason. Made with stir-fried rice noodles as a base, Pad Thai is widely served in Bangkok street food stalls and casual local eateries in Thailand. The dish is often served with eggs and chopped firm tofu, in addition to all the smaller ingredients that create the unique taste of pad thai: Tamarind pulp, fish sauce, dried shrimp, garlic, shallots, red chili pepper, palm sugar, lime wedges and sometimes, chopped roasted peanuts. The hype comes from the perfect balance among the condiments. The spicy of chili, sweetness from palm sugar, and finally, the sourness from tamarind pulp and lime juice – all make up a marvelous and tasty combination. Occasionally, other vegetables like bean sprouts, garlic chives, pickled radishes, turnips or raw banana flowers are also be included. 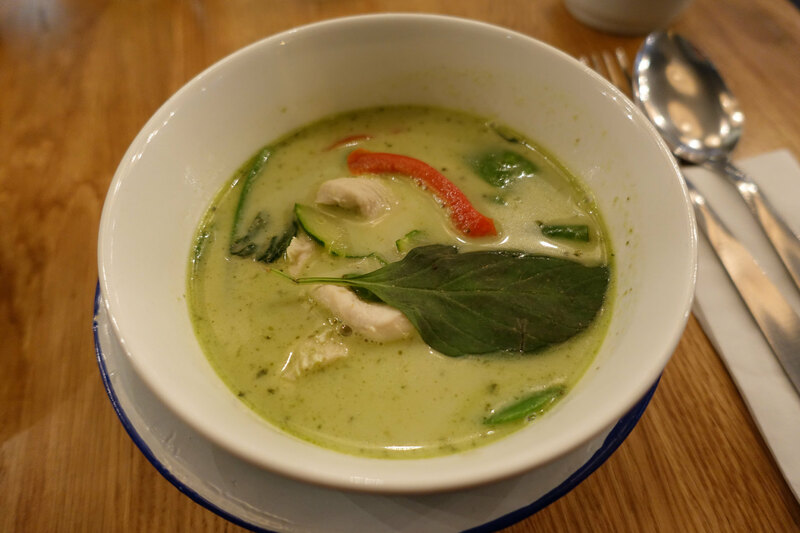 Thai green curry is normally served with chicken, eggplants, a splash of coconut milk, and of course, green chili peppers. Sometimes, basil leaves and lemongrass are also brought in to sweeten the bowl. The curry is well-known for being super spicy, which is the most prominent feature of Thai cuisines. Plenty versions of roadside Gang Kiew Wan Gai also prove to be pretty greasy and fatty at taste. Rolled ice cream, or Stir-fried ice cream, is a dessert made on a steel ice plate. Cream will be chilled until it hardesn then made into a roll. Soy or dairy milk will be poured onto the cold plate, together with the mixture of various types of fruits, green tea, coffee and plenty more flavorful ingredients. The whole chopping and stirring process has to be done fast before the ice cream begins to crystallize. Different kinds of toppings are often added up to the customer’s preference. This showy dessert displays a modern ice cream processing technique. There is barely a passing tourist that says no to I Tim Pad, as it’s so creamy and delicious. 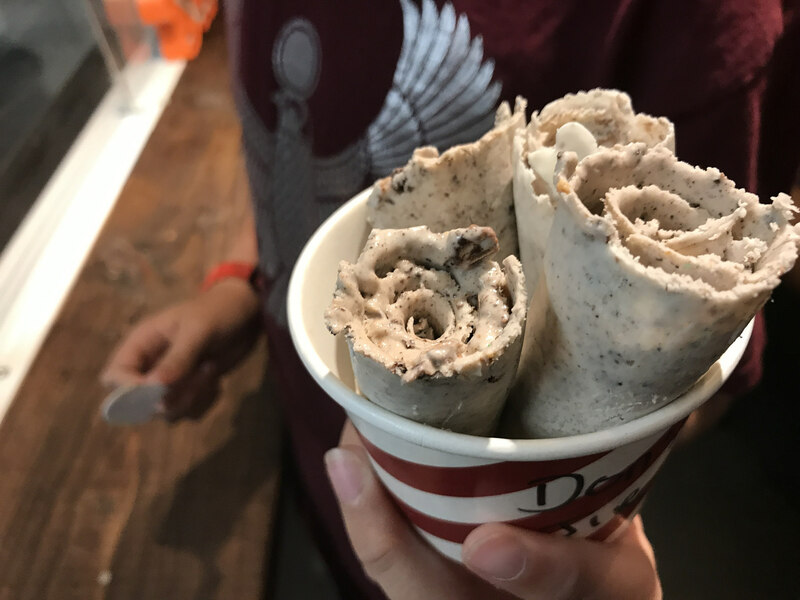 Rolled ice cream is truly a craze that should not be missed out ever. It’s not an exaggeration to say, when it comes to Bangkok, the food scene is among the bet in the world. When it comes to neighborhood eating coves, vendors or carts gather in groups, dining small restaurants and roadside stalls, there’s few places that can compete with the city of angels. Possessing authentically quintessential dishes always coming at an affordable price, Bangkok street food sure remains atop must-try lists of travelers.